To keep you, and your family safe. Mont Cascades is a non ­smoking park. Two areas are reserved for smokers at each end of the park. 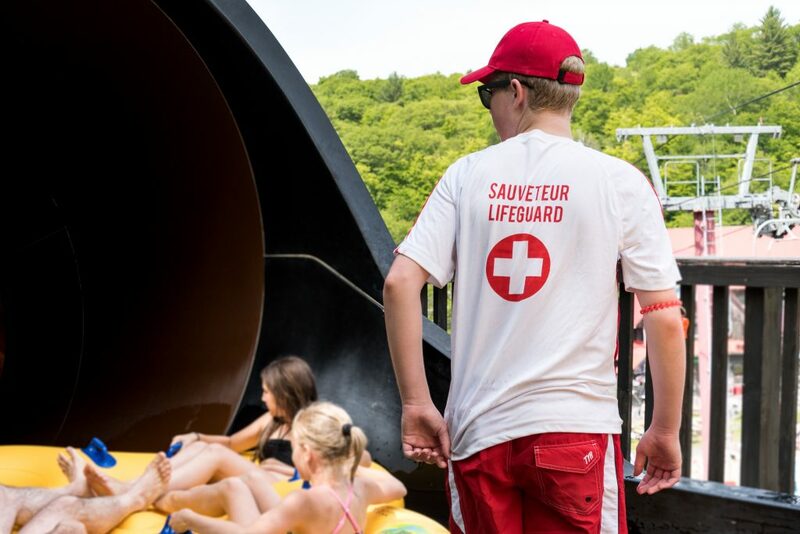 Instructions given by the lifeguards and other staff must be followed at all times. No running is allowed in the park. Children under 6 years of age must be supervised by a responsible adult at all times. For security purposes, some slides are reserved for individuals of 48 inches of height or more. Young children are not allowed to wear diapers while in pools or slides unless they are specifically made for swimming. BBQs, glass containers, alcoholic beverages, knives, beach tents, umbrellas and portable radios are prohibited on site. Diving and jumping are not allowed in pools. The main pool has a maximum depth of 1.4 metres. We therefore strongly suggest that you bring the appropriate floating equipment for children: life vests or floaters. No other floating equipment permitted. Make sure you read instructions at every slide before participating. In some slides (Kamikaze, Turbo Twister, Vortex), no loose clothing, glasses or jewelry is allowed.